Pants 9-14 kg 44 pcs. Japanese diapers gain popularity every day! 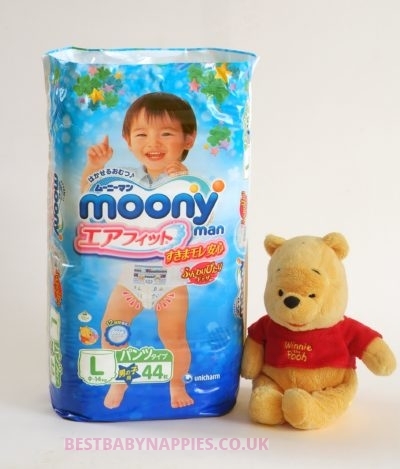 Moony diapers are made in Japan from highly-qualified fabric. Moony nappies have a unique diaper shape that allows a baby feel comfortable and soft, belly diaper band fits every baby. 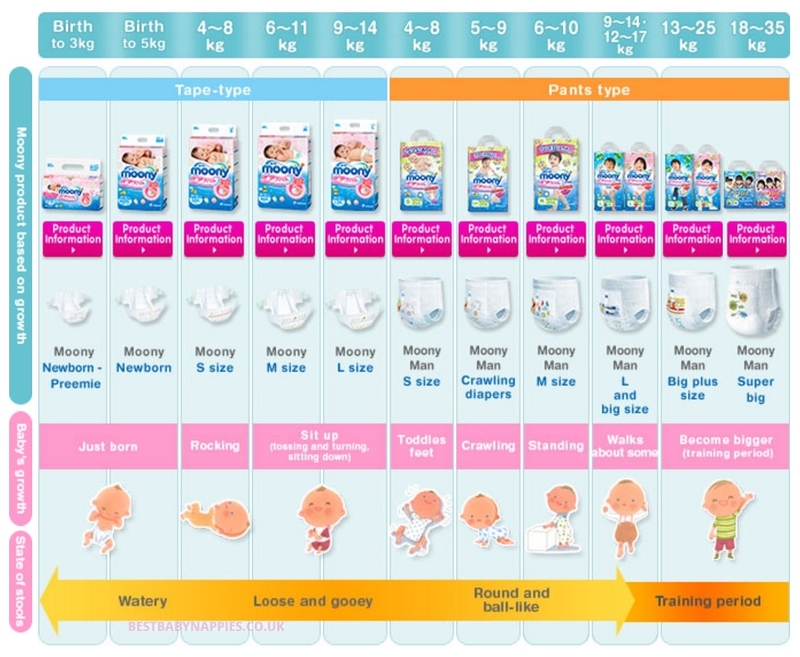 Moony diapers have a great size chart by weight. Moony diapers company is a very creative one, they suggest qualified baby products which you will not find anywhere else. Moony diapers reviews are available on the internet and you can order Moony diapers in all regions of the UK. Moony diapers delivery is possible in big cities, such as London, Liverpool, Leeds, Glasgow, Edinburgh, etc, but also to all small cities, such as Bristol, Birmingham, Cardiff, Belfast, etc. We are an official representative of Moony diapers manufacturer. Moony diapers are made from soft, non-allergic cotton nappy material so baby skin is always dry and healthy! Thus Moony prevents diaper rash, irritation and reddening. The inner layer of the diapers absorbs pee and soft poo at once, it helps to avoid leakage. Moony diapers sizes fully correspond babies’ physical particularities. Elastic bands on the waist fix the diaper, thus your baby is active! Diapers have fullness indicator that shows when it is time to change the diaper. Moony boys large (Moony L size) diapers fit babies from 9 to 14 kilos. Moony boys pants price for 44 items with sale from UK! WHY TO CHOOSE MOONY PANTS? Moony nappies follow the contour of baby skin that makes your baby active. Moony diapers are made from a soft material that protects baby from diaper rashes. Moony diapers tapes are made in a way to lower the pressure on baby’s tummy consequently not provoking rashes and reddening! 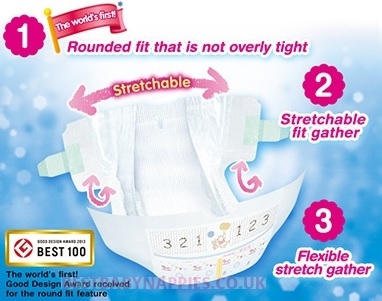 Moony nappies’ surface contours the body without leaving gaps for leakage. However, Moony diapers are soft and light so the baby does not feel it! Moony diapers stay dry up to 12 hours because of the special absorption system developed by Japanese scientists, thus baby feels dry for the whole day! Moony nappies have an indicator that changes its color from yellow to blue-green demonstrating how full the nappy is! Moony airfit diapers help parents to take care of a baby! Moony nappies allow skin to breathe, at the same time, perfectly keeping odours! A special anti-bacterial material keeps the baby skin dry and healthy, not letting microbes harm your baby! Moony pants give a unique opportunity to teach your precious baby to use a potty chair. HOW TO BUY MOONY PANTS?